U.S Polo Assn. brand products are authentic and officially sanctioned by the United States Polo Association, the governing body for the sport of polo in the United States since 1890. U.S Polo Assn. is committed to bringing excellence and high quality to everything that they devote themselves towards, guaranteeing the complete satisfaction of all of our customers. U.S Polo Assn. carries an extensive selection of bedding products including sheet sets, memory foam pillows, mattress toppers and more. We strive daily to bring our customers the best product for their money, while ensuring the reliability and dependency of our brand. 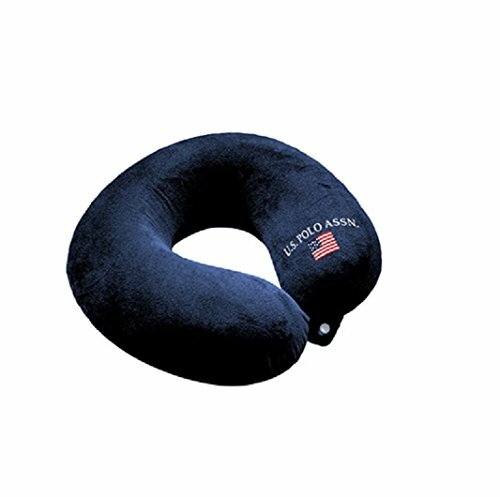 Not associated with Polo Ralph Lauren Corp. U.S. Polo Association Memory Foam travel pillows are covered in a luxuriously soft polyester plush velour outer cover which provides a much needed warm and comfortable resting place for your neck during travel. The high quality, resilient and extra dense memory foam molds perfectly to your neck for maximum comfort. Comfortable Design: U.S. Polo Association Memory Foam travel pillows are covered in a luxuriously soft polyester plush velour outer cover which provides a much needed warm and comfortable resting place for your neck during travel. The high quality, resilient and extra dense memory foam molds perfectly to your neck for maximum comfort. Neck Support: Eliminate pressure points and keep your posture during sleep using this travel neck pillow. Created with your comfort in mind, our U.S. Polo Assn. neck pillows wraps gently around the neck to relax your muscles while providing super soft and perfect support to the head, neck, and chin to prevent stiff neck. Usage: Great for all travel use, this pillow is perfect for use in car, truck, bus, train and most importantly for plane use. Perfect for students and teachers, this neck pillow can be used in class or in your office during a long day sitting at your desk! Space Saving Feature: Designed with efficiency in mind, our travel pillows make it easy to attach to a carry-on luggage using the snap-closure. The memory foam can be compressed into a tight position to allow for easy space-saving storage during travel. Care Instructions: Ease of Care, the removable zippered cover is machine-washable for easy cleaning and germ prevention post travel. For drying: tumble dry low and remove them promptly from dryer. Not affiliated with Polo Ralph Lauren Corp.
BONAIR OUTFITTERS Travel Foot Rest Pillow, Height-Adjustable Inflatable Travel Bed for Kids. Perfect Airplane Travel Accessories, Car Seat Footrest, Leg Rest Pillow, Travel Bed for Kid.